A huge THANK YOU to those of you who joined us for Stonehenge: The Event. It was informative, entertaining, and a lot of fun. We appreciate you being here . . . our customers are the best!!! We would also like to remind you to sign up for one of these classes. Pumpkins: Sat. Oct. 6, 9:00 a.m. Make your choice of a round table topper, runner, or chair back. Black fabric silhouettes the design and creates a rich and dramatic effect. Fusible web applique makes it easier than it looks! Machine Applique: Thursday, Oct 4, 6:00 p.m. Learn several methods of machine applique including invisible stitching. You'll be amazed at how easy it is and the technique will enable you to make beautiful quilts and other projects. 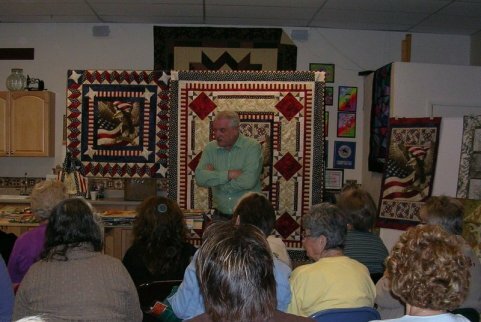 This is a class every quilter should have. Hexagon Table Topper: Tuesday, Oct. 9, 6:00 p.m. Using a 60 degree triangle ruler and fabric of your choosing, make a topper that will delight you and everyone else. Select fall, Halloween, Christmas or home decor fabrics. All NIghter: Friday, Oct. 12, 6:00 p.m. Bring an unfinished project or start a new one. Come with a favorite food and stay as long as you like. A great night to sew and visit.